Cocaine users are at risk of life-threatening stomach problems, doctors have warned. Writing in the Journal of the Royal Society of Medicine, two London-based doctors said such abdominal complications were rare. But they warned incidences could rise in the UK, as they have in the US. 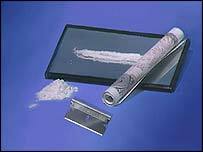 Cocaine use has increased considerably over the last 10 years, and it is estimated 344,000 people abuse cocaine in the UK every month. Experts estimate around 17,000 use crack - the smoked form of the drug. Stomach symptoms seen in cocaine users include abdominal pain and tenderness, nausea, vomiting, nausea and bloody diarrhoea. These can occur up to 48 hours after taking the drug. Writing in the JRSM, Mr Luke Meleagros, a consultant surgeon at North Middlesex University Hospital describes how he and his colleagues have recently seen two cases of gastrointestinal perforation linked to cocaine use within weeks of each other. He said: "Abdominal complications from cocaine abuse are life-threatening and require emergency surgery. "In extreme cases a patient may end up with a colostomy." He said cocaine abuse was a serious problem in the UK and in particular, London. Mr Meleagros said: "Abdominal complications are more common with users of crack cocaine and in poor, inner city areas. "However, we suspect that there is an under-reporting, or misrecognition, of the problem in other areas, particularly affluent areas, as these complications occur in cocaine users as well." But he added: "As the number of cocaine abusers rises we expect the accompanying health complications to spread across the country." Mr Meleagros said their report drew attention to the complication, but more work was needed. "We'd certainly be interested to see the experience of other hospitals to gain a better understanding of the extent of the problem," he added. Stomach problems following cocaine use are less common than other complications such as chest pain and problems breathing. But the researchers urged doctors to be aware of the risk of abdominal complications in patients who used cocaine. Martin Barnes, chief executive of DrugScope , the drug information charity, said: "These findings underline that cocaine is a harmful drug. "The cardiovascular and respiratory dangers associated with heavy or prolonged cocaine use are well-documented, but this report suggests there may also be abdominal complications which are less detectable. "There needs to be better awareness and much more training for hospital doctors and GPs on illegal drugs and their harms, particularly those in contact with younger adults and young people."